It seems like almost everyone above the age of fifteen has played Super Mario Bros. , making the theme song an indelible and shared experience. That's why a lot of people like to mess with it. 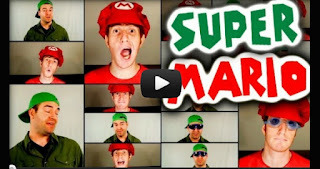 Here's 7 videos of people singing music from Super Mario Bros a capella. 7. CSVY performing tenor, soprano, alto, and two drum tracks by himself. 6. A choir sings the theme song to Super Mario, along with a few other games. Mario Bros ends at 1:19, if you want to skip the rest. 5. Analy High School's Vocal Ensemble did a performance and they included props. 4. This performance comes from a Norweigan TV show called The Big Choir Battle. They used props, too, very impressively. 3. Jimmy Wong did more of a remix, and it turned out really well. 2. But by far, the best cover is by Nick McKaig and Julien Neel. What did you think of the videos? Which one was your favorite? You're welcome, thanks for visiting. Awesome job! Now, if someone does the theme to Starcraft, I'll really be impressed! Amazon had an album of video game music done by the London Symphony Orchestra. Super Mario is my favorite one on there. That and Tetris. They don't make video game music like that anymore. I mean the newer themes on there were all this theatrical Hans Zimmer stuff. Boring. Where's the pep?